Joseph Najnudel, mathematician and accomplished pianist, will give a public piano recital on June 13th, beginning at 17:30h in the MPIM lecture hall. Everybody and their families are cordially invited. The concert is free of charge. Geometric quantities of a surface, like distance, angle, or area, change when the surface is deformed. Euler discovered a quantity, the Euler characteristic, which remains unchanged. The formula of Gauss-Bonnet, a landmark result of mathematics, relates Euler characteristic with geometry. In the talk, I will present ideas of Descartes, Euler, and Gauss related to this formula. Coarse geometry can lead to useful classifications. For example, the word metric on a finitely presented group recognises (up to finite groups) if that group is the fundamental group of a 3-manifold and it carries a lot of information about the manifold. I will mainly talk about coarse geometry for complex surfaces, showing that bilipschitz geometry, which is purely topological and ignores any analytic structure, can recover the local analytic structure up to Zariski equisingularity. (Joint work with Anne Pichon). In 1956, the Dutch graphic artist M.C. Escher made an unusual lithograph with the title `Print Gallery‘. It shows a young man viewing a print in an exhibition gallery. Amongst the buildings depicted on the print, he sees paradoxically the very same gallery that he is standing in. A lot is known about the way in which Escher made his lithograph. It is not nearly as well known that it contains a hidden `Droste effect‘, or infinite repetition; but this is brought to light by a mathematical analysis of the studies used by Escher. 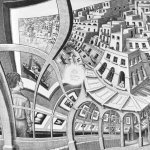 On the basis of this discovery, a team of mathematicians at Leiden produced a series of hallucinating computer animations. These show, among others, what happens inside the mysterious spot in the middle of the lithograph that Escher left blank. The story told in this lecture starts with an innocuous little geometry problem, posed in a September 2006 blog entry by R. Nandakumar, an engineer from Calcutta, India: "Can you cut every polygon into a prescribed number of convex pieces that have equal area and equal perimeter?" This little problem is a "sparrow", tantalizing, not as easy as one could perhaps expect, and Recreational Mathematics: of no practical use. A team of mathematicians is working together on a big project. Excitement of discovery, hope and disappointment, competition and recognition are shown from an infinitely close distance. Scientists united by the idea of discretization, which, in short, means: constructing continuous objects from basic building blocks. Akin to the scientists’ search for the right discretization of continuum, this film itself is composed of fragments – individual characters of different ages, temperaments and scientific approaches – which form a single continuous melody. This Thursday, January 21st at 19:00h, members of the larger MPIM community will give us the honor of an informal musical concert. First, Carmen Rovi (Piano), Matthias Kreck (Cello), and Yael Fregier (Baritone) will play and sing classical pieces by Mozart, Schubert, Schumann, and Wagner. This is followed by a short break and some traditional folk music performed by the MPIM folk group with Tim Ballance (fiddle), Kristian Hodén (button accordeon), Pavel Mnev (flutes), Davide Spriano (electric bass), and Alessandro Valentino (acoustic guitar). Everybody from the math community in Bonn and their families are welcome. What is the history of mathematics? And who is it written for? This talk introduces the world history of mathematics in the 17th century to a general audience; unlike the conventional approach of viewing the history of mathematics in order to make a comparison between different parts of the world, this talk traces the pathway of mathematical ideas across nations, and observes the 17th century world on a global scale. We will start our journey in Kyoto, and will investigate the intellectual cultures of Europe and China. The presentation uses various techniques of digital humanities. Since ancient times geometric concepts have been used to model astronomical phenomena such as the motion of the planets. In modern times geometry has merged with analysis to provide accurate models of gravitational phenomena involving stars and their planets, black holes and gravitational waves in the context of General Relativity - with the new mathematical insights leading also to progress in the understanding of many other phenomena surrounding us. The lecture describes in a non-technical way how ancient geometric concepts such as the isoperimetric inequality as well as classical concepts from Newtonian physics reappear in the curved space-times of General Relativity. John L. Heilbron is Professor of History and Vice-Chancellor Emeritus, University of California, Berkeley, and Honorary Fellow, Worcester College, Oxford. His talk is drawn from material in and reflections on his recent books, Galileo (2010) and (with Finn Aaserud) Love, literature, and the quantum atom. Niels Bohr's 1913 trilogy revisited (2013), both from Oxford University Press. The music theorist Thomas Noll, currently a guest at the Max Planck Institute for Mathematics, will give a public lecture about his research on the relation between music and mathematics. This documentary is a celebration of the story of Ramanujan while walking in his footsteps trying to fathom his genius. I will begin with a very short (less than 5 minutes) introduction to the making of the documentary. Then we will watch the documentary; it is about one hour long. Finally, I can (try to) answer any questions the audience might have. Anges Handwerk and Harrie Willems have made a remarkable documentary about the life and work of Yuri Manin, Emeritus Director at the Max Institute for Mathematics in Bonn, who began his career as a student at Moscow State University in the year of Stalin's death 1953 and whose subsequent professional life reflects the history of mathematics and mathematicians trying to overcome the political constraints of that time. The film will be shown for the first time in Bonn, prior to its publication by Springer in 2012. The directors will be present and available for questions and discussion after the screening. Die Friedrich-Hirzebruch-Vorlesung ist eine jährlich stattfindende Reihe von öffentlichen Vorträgen, die 2007 anlässlich des 80. Geburtstags von Prof. Friedrich Hirzebruch ins Leben gerufen wurde. Die Vorlesungen richten sich an ein breites Publikum und sollen die vielfältigen Verbindungen zwischen Mathematik, Kunst, Gesellschaft, und anderen Gebieten beleuchten. Die bisherigen Sprecher waren Sir Michael Atiyah, Hans Magnus Enzensberger, Don Zagier, Yuri Manin und Hendrik Lenstra. »Ein Mathematiker, der nicht etwas Poet ist, wird nimmer ein vollkommener Mathematiker sein«, schreibt der Mathematiker Weierstraß im August 1883 an Sofja Kowalewskaja. Aber ist die Mathematik als exakteste der Wissenschaften nicht eigentlich die Gegenspielerin der Poesie? Ist es nicht wie für Lessing »gewiß, daß dasjenige, was die Poesie von der Mathematik borgt, den Witz vertrocknet und ihn zu einer körperlichen Genauigkeit gewöhnet, welche mit der metaphysischen Genauigkeit der Dichter gar keine Verwandtschaft hat«? Politische Raumkurven. Zur hundertjährigen Geschichte einer mathematischen "Tatsache"
Ein kurzes Gegenbeispiel, das der junge Theodor Vahlen 1891 veröffentlichte und das ein halbes Jahrundert lang als Teil des mathematisches Menscheitswissens galt, wurde plötzlich im Zweiten Weltkrieg druch Oskar Perron zum Mittelpunkt einer politisch-mathematischen Debatte. Im ersten Teil des Vortrags erinnern wir zunächst an diese Geschichte. Das Beispiel ist schon deshalb interessant, weil mathematisch-politische Debatten nicht sehr häufig sind. Ausserdem aber werfen wir im zweiten Teil einen frischen Blick auf das Problem.